Drosophila melanogaster, the lowly fruit fly, is the one creature whose olfactory system is the most extensively studied of any animal. 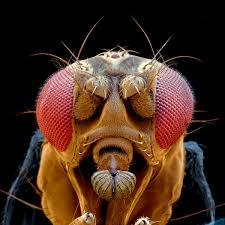 Most of what we know about human olfaction was first studied via the fruit fly. 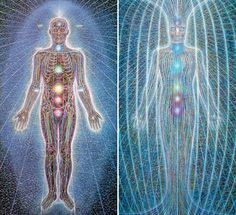 Actually, a lot of what we know about human biology and genetics in general come from this, the most scientifically useful eukaryote there is. Caenorhabditis elegans (C. elegans, the lowly roundworm) is a close second for premier entomological fame, but their olfactory system is too different from ours (and I’m not really sure if worms are insects anyway). "[Your fingerprint] contains molecules from within your body but also molecules that you have just contaminated your fingertips with, so the amount of information there potentially to retrieve is huge." And this information is now set to be used in courtrooms. It comes as a surprise to me that this technique is only being used now. We've known since the dawn of the microscope that the labyrinthine ridges of our fingertips are stuffed with bacteria and whatever else in the world we recently touched. We've also been using this mass spectrometer tool since the 1900's, which is also when fingerprinting itself came out. 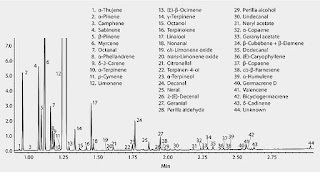 I’m adding this to the archives here because the mass spectrometer, combined with the gas chromatograph, is the primary tool for detecting odorous molecules. It’s the closest thing to an artificial nose that we have, and it’s the only we to determine with certainty what’s in a smell. I’ve added below a chart taken from Sigma Aldrich, a supplier of essential oils for the flavor and fragrance industry. It shows the fingerprint, if you will, of the smell of orange. 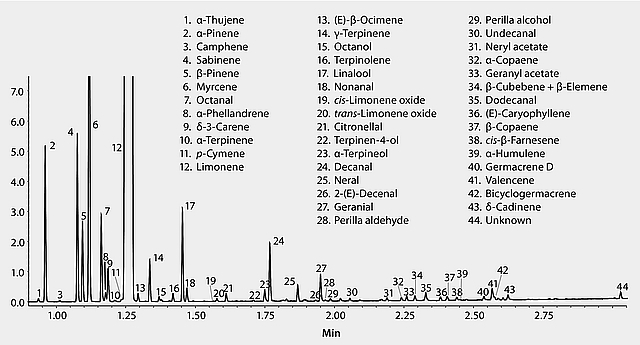 The smell of orange, as seen in gas chromatograph analysis, courtesy of Sigma Aldrich. As you can see, the smell of orange has in it way more than just “orange.” In fact, there’s nothing called “orange” in there at all. Limonene and Citronellol might sound like they belong there, but the others are probably foreign to most. Hey, you dropped something. The back of your earring, it’s gotta be somewhere in this shaggy carpet. Hands and knees you search intently in a one foot radius of the spot you think it should be. 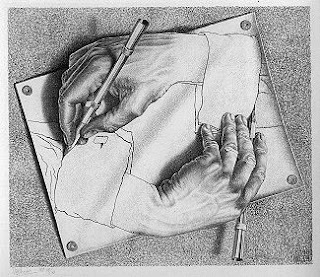 After some time, your search-space widens, you move over a few feet, and begin again, very concentrated. This is the foraging pattern. In searching for blackberries, you stop at this bush and look and look and look, and then you go to another bush altogether, and so on. It’s a lot like fractals, and a lot like Antonio Barabasi’s Bursts. The pattern of searching, or foraging, occurs in clusters. And the search-pattern within the clusters is repeated in the larger pattern of the clusters relative to each other. Taken to its conceptual limit, we observe the common roundworm, neuropop celebrity extraordinaire, C. Elegans. If a worm thinks there is food somewhere, it will perform an intensive search in that local area, until 15 minutes are up, at which time they will literally make less turns, and explore a wider, more global area. 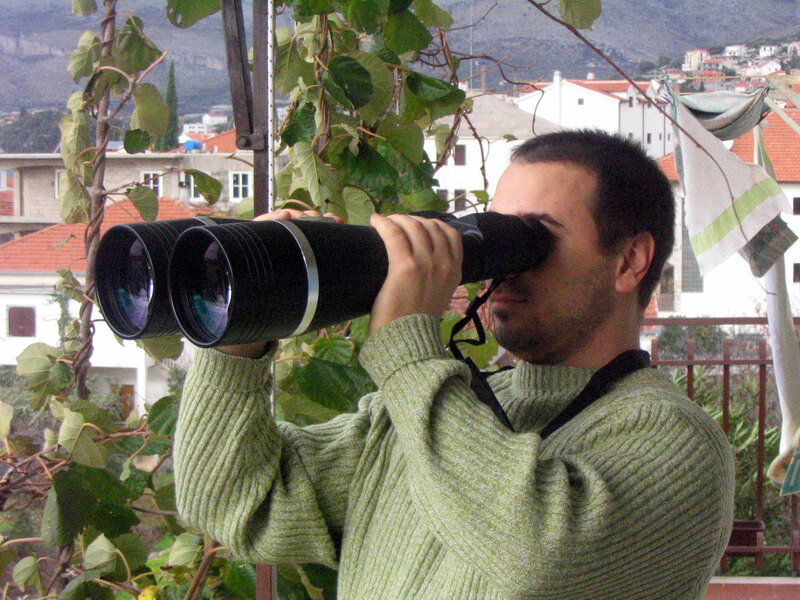 Humans usually rely on vision to search for things. Worms don’t; it’s much more effective for them to follow their nose. In this case, their search is informed by a chemical gradient. As they search for the source of an odor, they notice whether their target scent is getting closer or further. This is the chemical gradient, and it, in a sense, decides for the worm. All the worm needs is a memory big enough to store the last sniff, and compare it against the current one, and it can decide whether to go ahead, or to turn. In reality, the worm has more than just a one-sniff memory capacity. It is in fact creating a gradient map of all the places it searches, as it searches. The seemingly infinite wonder that is the human memory begins with this basic foundation. And it is for this reason that smell and memory are such an intimate, indivisible pair. What happens when the worm has no chemical gradient to help it decide? This is where it switches from chemotaxis to infotaxis. And I bring this up simply as an excuse to use the word infotaxis, because I really like it. Also, I was thinking about the future, and the idea of infotax, which, considering the advance of Bitcoin, might not be too far off. And then, there’s info-taxis, like taxi-the-car, which I can’t even imagine what that is or what it will do, but it will probably happen too. Wörter und Sachen means "Words and Things" in German. It refers to a movement in Germany/Austria, in the early 20th century, that insisted we use the etymology of words to study the cultural products named by those words. It’s also a 1959 book by Ernst Gellner* titled Words and Things: An Examination Of, and an Attack On, Linguistic Philosophy. The study of the language of smells requires a most astute clarification of the words from the things, which is made most difficult by the fact that smells are the things their words describe. The smell of an orange is an orange. 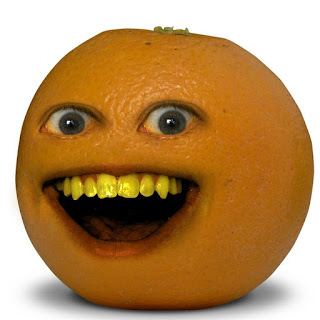 The color of an orange is not. The color of anything is instead white light being reflected off of a surface, the color being the portion of that white spectrum not absorbed into the surface. So the color of a thing is almost like the opposite of the thing. *Gellner is a personal favorite of mine; I have many posts on my other blog inspired by him or in reference to another work of his, Plough, Sword and Book (1988). Just thinking here about the intersection of genes and culture and their effects on our olfactory world. This article mentions that one of the differences between people with lots of Neanderthal genes (Caucasians and to a lesser extent Asians) and people without so many Neanderthal genes (Africans) is that the Africans have a distaste for pork. I'm not an expert here, please note. But I do recall a variation on a gene that codes for pork, making male boar taste like piss to some folks but sweet to others. There's another one, not related to cavemen (as far as I know), that makes cilantro taste like soap to some people and yet a delicious herb to others. The fact that these examples even appear in the news is because taste is far more conspicuous than smell (despite the fact that most of what we taste is actually smell). 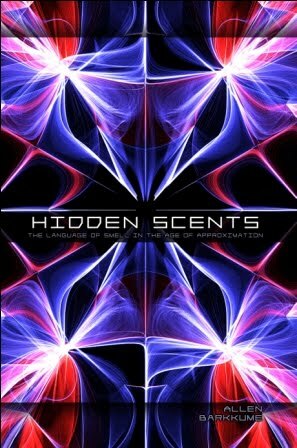 But these examples of varying genes for coding sensory perception are at least a good reminder of the fact that our sense of smell is proof that we are still evolving. Two percent of our genome is devoted to smell - of our 10,000 genes, 250 are for smelling. The way genes work is complex, and simple arithmetic is no way to measure it, and 2% might not even sound like a lot, but still - these 250 smelling-genes are the largest of all the gene families. What's more, many of these genes have variations, called alleles, like hair varying from black to brown to red to blonde. That means the way something smells to you may differ from that of other people. While listening to a talk on this stuff given by a smell Nobel, Richard Axel, I discovered that the gene, or genes, that code for some of the aroma compounds in broccoli have variations. That means some people taste the bad part of broccoli more than others, or that some people taste the good part more than others. Bottom line is that broccoli is not the same for everyone. And this goes for lots of things. As far as we know, there is no allele on the genes that we use for vision. We have three photoreceptors, controlled by 3 genes (again I'm not an expert, maybe it's more complicated than this). We agree on colors, which is to say that we all see the same colors in the same way. This means that we are done evolving in regards to color (yes?). But when you see this many [olfactory] mutations occuring throughout the population, well, it means that we are still in the process of evolving. We aren't growing extra toes, or losing tails, but we are still going through the process. Back in the day, part of this process involved a Homo Sapien seducing a Neanderthal, and making mutant cross-species babies. Before that, it meant walking on the ground instead of swinging in the trees. Today, I think we would have no idea what is really steering our species in one direction or another, but the fact that we all have such a variety of different smelling-genomes is proof that it's still happening. Solar-powered self-mowing lawnmowers are the most mind-numbing thing there is, when you think about it. Second in line is the fact that we have had to build structures to keep the Alaskan gas pipeline from sinking into the earth due to global warming. 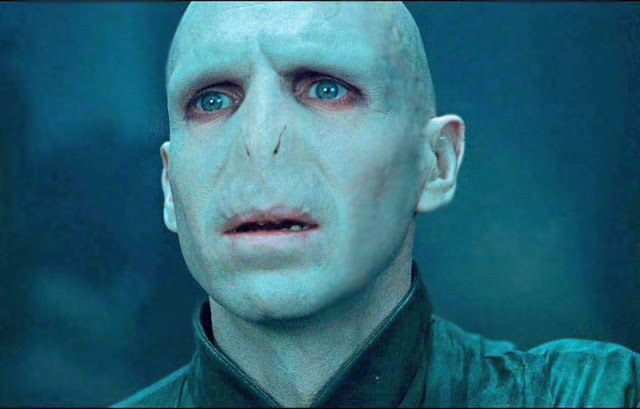 Voldemort has nothing to do with Charles Darwin, or Greg Bear, but he has no nose. Children communicate by using psychoactive chemical scents made from their own bodies. A beautiful twist on the idea that smell is a vestigial organ or perception. At one point, a boy consciously secretes from his own body a mind-controlling scent, wipes it on sheets of paper, crumples them up and throws them at the seat next kidnapping bus-driver, who becomes overtaken by the boy’s vaporous emissions.